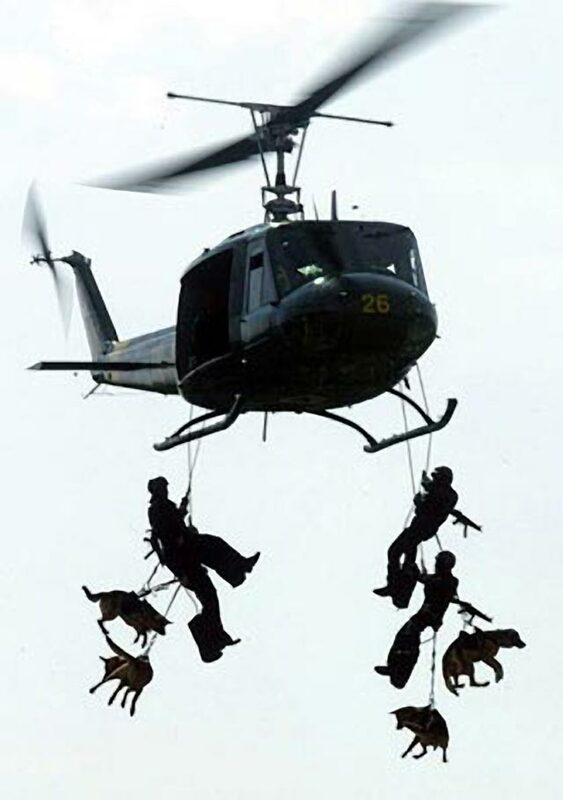 Dogs have been helping humans in their military endeavors since the dawn of ages. They helped track and protect early humans in Egypt and Babylon just as during the U.S. Civil War. Some dogs were publicly recognized for their bravery by the troops and the civilians, with the most famous being Stubby, a stray bulldog mix, who not only became the most decorated dog of World War I, but the only dog promoted to sergeant through combat. The list of famous serving dogs is exhaustive, but is still growing. At the onset of the Second World War, regular citizens, hoping to help with the war effort, brought puppies to military bases. 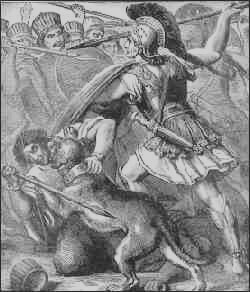 Naturally, through time, many dogs were trained to threaten and attack the enemy, but it is their noses that humans have always found most helpful. Not to mention their undeniable bravery and devotion. 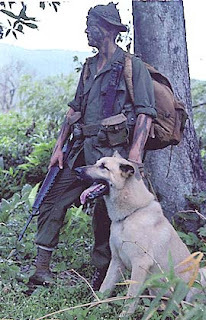 During Vietnam War alone, canine fighters helped save, by some estimates, over 10,000 human lives. As a result, it is appalling to learn that despite all that service and heroism U.S. military classified these military dogs as “excess equipment” and ordered them euthanized at the end of their Vietnam service. Handlers, who lived through that harrowing experience, have been creating War Dog Memorials across the country and recently on the web every since. It is these devoted men, who have been trying to educate the public about the kind of service those dogs have performed for the ungrateful nation. In more recent times, the world has gotten itself into various new military conflicts again, so stories of new war dogs started to make headlines. Most have heard of a Belgian Malinois dog, named Cairo, with his titanium enclosed fangs, sent with the elite SEAL team to track and take down Bin Laden. Some of us might have seen a news story of a bomb dog called Eli, in Afghanistan, who climbed on top of his handler’s body to protect him from sniper’s vicious bullets after he was fatally shot. 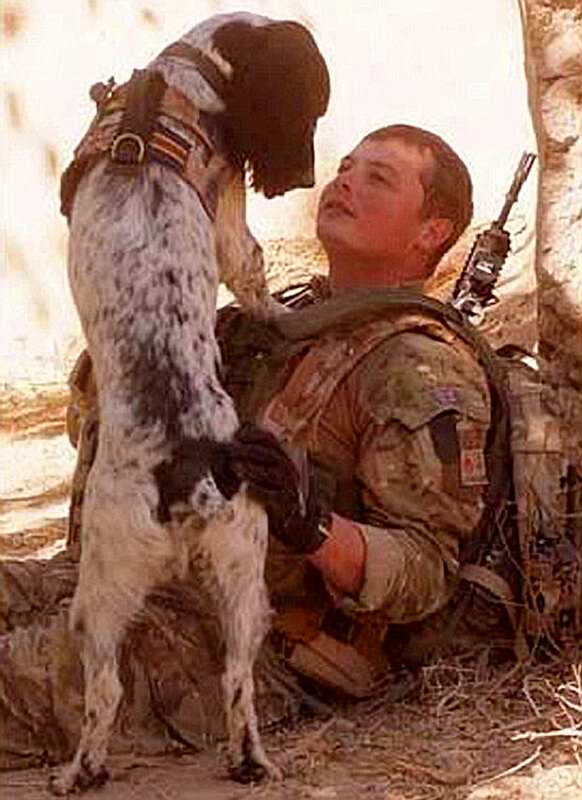 Who can forget the one about Theo, the now legendary Springer spaniel bomb sniffer from England who died of a broken heart two short months after his handler got killed by an IED. 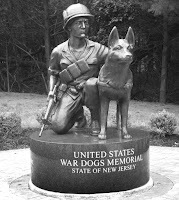 A recent article in the Foreign Policy magazine, estimates there had been over 2,800 active duty “war dogs” deployed alongside their human counterparts since the early 2010 by the U.S. alone. We all know dogs are used by the military in recent years, but few of us ever know what happens to them after they “retire”. Many things have changed since Vietnam, so it is logical to assume that after spending upward of $50,000 on each dog’s breeding and training the government would treasure the investment enough to reward the loyal animal with a chance at adoption. After the culmination of the Gulf War, after both finished their tour, it took one determined dog handler months of petitioning to try to adopt his war companion, Robby. Time and again he was denied because retiring war dogs were still considered obsolete equipment, which automatically made them “un-adoptable”. He took his crusade through local legislation to Congressman Roscoe Bartlett, who drafted a bill, which in November 2000 became Robby’s law. As a result, civilians were finally allowed to adopt these dogs, but it didn’t help Robby, who was euthanized before his handler was allowed to get him. Years and military conflicts later, things are still far from easy for these courageous mutts when it comes to getting to a family of their own. Is it fair to repay a soldier’s valor with no ticket home? For decades now the Lackland AirForce base is the main military facility responsible for breeding and training military dogs. Its representatives announced a month ago that the waiting list to adopt their dogs now exceeds six months in length, and that no dogs have been euthanized for a while now thanks to the new law, growing fame of Bin Laden’s tracker Cairo and tireless work of several non-profits aimed at educating the public about the process. One such well-known non-profit organization called Military Working Dogs Adoptions tirelessly helps civilian families with war dog adoptions. Yet one stumbling block still remains. The unexpected problem lies in the fact that transporting war dogs to the place of their service is considered part of their military deployment, whereas returning them back to the U.S. is judged an excessive use of taxpayers’ dollars. To get around that, all willing adopters are required to pay the exorbitant expense of private transportation. Military’s argument is hinging on a legal definition of a dog or any animal in its possession. Despite feelings of friendship and even love from these dogs' handlers, in the eyes of the law any such animal is no more than property. Backed by that concept, the military still has a legal right to consider its furry soldiers - equipment. Ever since Vietnam and even more so now, people had been banding together to push through various proposals and petitions to reclassify retiring military dogs into canine veterans. Legally changing this one definition would immediately impact many dog's lives. Most dogs serve on average 8-10 years, so when they are released from service, being a large breed, their life expectancy is on average 2-4 more years. After a long, faithful and grueling service, it’s only natural to want to give these four-legged heroes a kind of retirement they deserve rather than miring their new lives in red tape of exorbitant costs to their new families. "Canine veterans" law anybody?